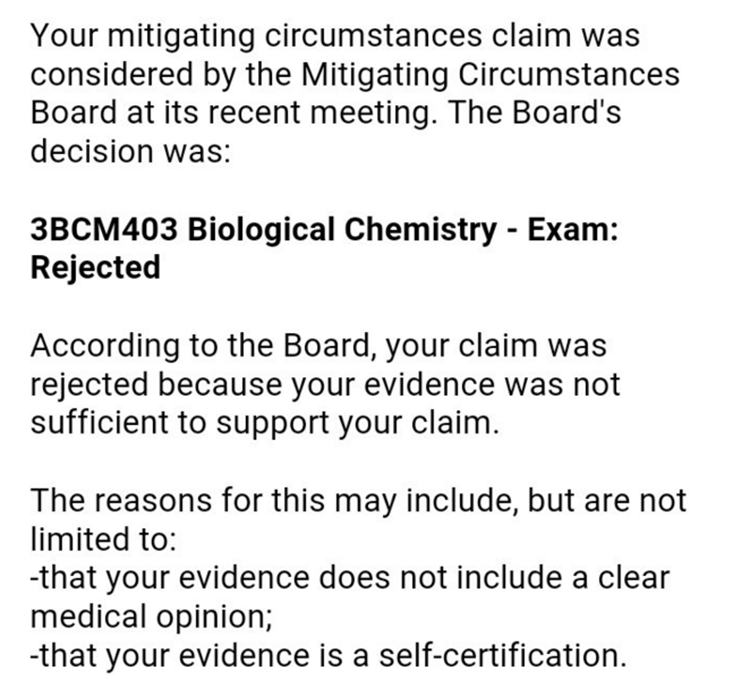 A mourning student has had her request to defer her exams rejected because she hadn't provided enough evidence that her dad had died. After Saima Haq's father died suddenly whilst on holiday abroad, the 18-year-old student decided she couldn't cope with exams right now, and requested her uni defer her exams until July. She was then shocked by how unreasonable her University was in response to her request. When her request was rejected, she took to Twitter to tell her story. 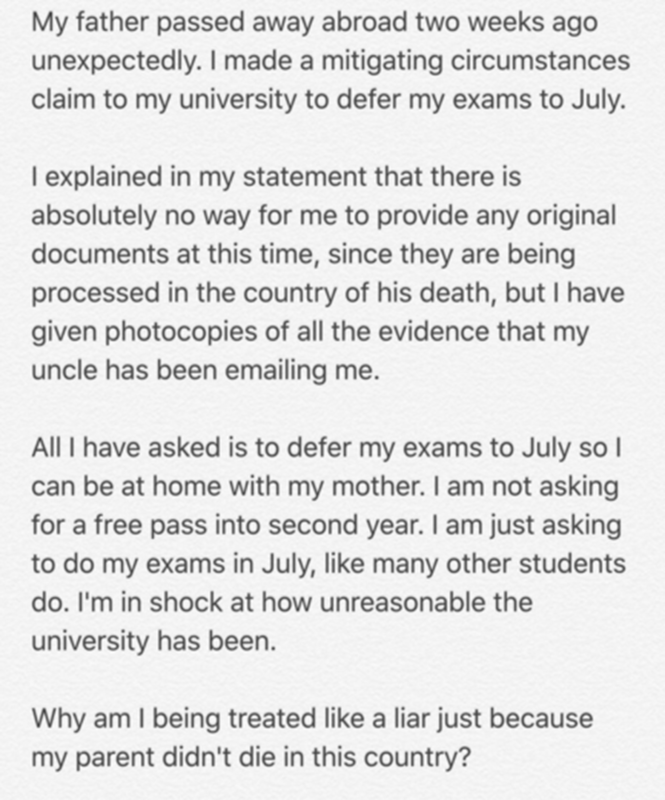 Saima then received this response from the University of Westminster, explaining that she had provided "insufficient evidence" of her claim that her dad had died. 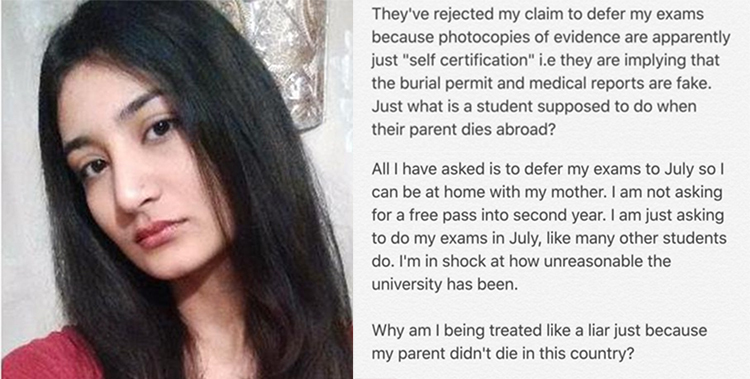 Saima, who studies biochemistry, was shocked at how unsupportive her university has been at this difficult time, and their refusal to accept anything other than the original death certificate as proof that her dad had in fact died whilst he was abroad. 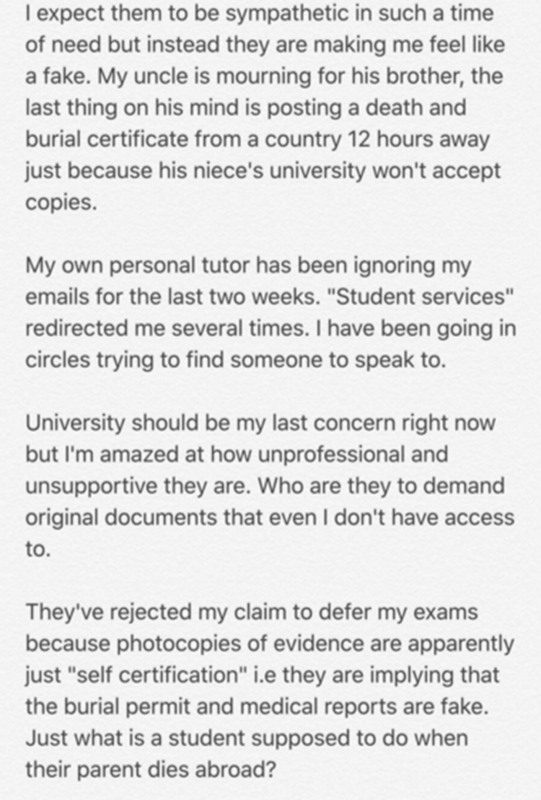 She believes that the way the University worded their response implied that they didn't believe her claim was genuine, and that they even thought the burial permit was faked. After Saima tweeted her story and received hundreds of retweets, the University tweeted back to Saima. @saimahvq Dear Saima, we are very sorry to hear about your loss. Could you please DM us so that we can look into your case? A spokesperson then told the Independent that they felt sad for Saima, but had robust procedures for exam deferrals. "We have clear and robust procedures for students submitting exam deferral requests, which must be substantiated by original, independent documentary evidence." Ie if someone close to you dies and you need your exams deferred, you'd sure as hell better prove it. Saima is still waiting on a new decision from her University on her case.